I have already told you about Roberto Danubio and his Summer Camp, but I have never told you anything about the Wado Spirit, the seminar held every year in December in his Dojo in Weinfelden, Switzerland, a stone’s throw from Lake Constance. And I did not tell you anything because I never had the chance to go there, before December 2nd of this year. Weinfelden is a small town in the north of Switzerland, capital of the canton of Thurgau and known to those who, like me, love Ice Hockey to be the base of operations of HC Thurgau, a respected team that plays in the Swiss League. And it is an important center of Swiss karate thanks to Roberto Danubio, who has been managing the Renshin Kan Dojo for years. 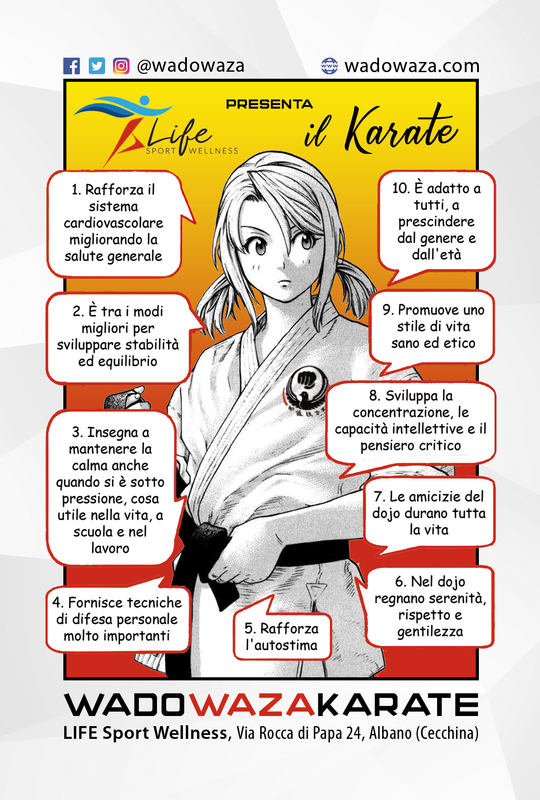 It is worth mentioning that Master Danubio, 7th dan JKF Wadokai, is president and head instructor of the SWKR – Swiss Wadokai Karatedo Renmei, the Swiss association of Wado-ryu which refers to the Japan Karatedo Federation Wado-Kai. From his dojo in Weinfelden, some of the best wadokas found in Europe today have come out. Not bad for a town of eleven thousand of souls. Getting to Weinfelden is not difficult. Forty-five minutes of drive from Zurich airport or roughly the same time from the station, also in Zurich, for those who prefer the train. I and my eight colleagues from the WKSI attending the seminar rented a Mercedes Vito, spending, each, less than the train ticket. In addition to ours from Italy, there were delegations from other European countries, such as Belgium and Ireland. But perhaps you’re wondering why I’m pulling you so long, instead of immediately entering the seminar. Well, the reason is that it is not easy to tell the Wado Spirit. The atmosphere that you breathe there is special and the intensity of training, deepening and human relationships are such as to dilate time and confuse it in memory. I’ll try to make things easier by starting with the name that Roberto Danubio has chosen for this annual event. Wado Spirit. The spirit of Wado-ryu. A name that sounds damn good. Fact that, alone, it would justify the choice. But for those who know Master Danubio it is not difficult to imagine that, in all likelihood, he has not chosen it just because it’s cool, but also because, by itself, it already says a lot about the objectives of the seminar itself. Wado is a word composed of two ideograms (kanji, in Japanese) Wa and Do. Do means Way, while Wa has many semantic nuances and can be translated with meekness, the act of putting together, union, peace, harmony, sum, kindness. Therefore we can affirm that the Wado spirit corresponds to that of the way that leads to each of these qualities. Wado Spirit starts at lunchtime and ends after the sunset. Four hours of training during which the teachers grants just a couple of breaks lasting no more than two minutes each. In those four hours, the entire Wado-ryu program is practiced and studied in depth, technique by technique. This fact, by itself, says a lot of the pace that must be sustained during this appointment. In addition to Roberto Danubio, the conductors of the seminar were the masters Alessandro Danubio, 6th dan JKF Wadokai, Eveline Danubio, 5th dan JKF Wadokai and Rolf Wirth, 5th dan JKF Wadokai. Over seventy wadokas were present and the glance, if one looked around, was impressive. The Renshin Kan is a two hundred square meters dojo in perfect Japanese style. Being rectangular, on the two long sides there are the kamiza on one side and, on the other, a wall of mirrors that makes the room seem even more spacious. On the wall of the kamiza there is an impressive wooden torii (the traditional Japanese gateway to the sacred areas) which makes the atmosphere austere and welcoming at the same time. Inside the torii, on a large Japanese calligraphy framed in cherry wood stand the ideograms Wa and Do, and on the sides of the torii six calligraphies, three on the right and three on the left, list, in Japanese, the precepts of the Dojo Kun, the traditional rules of behavior of karate. Impossible not to be fascinated by the beauty of Renshin Kan dojo. Especially when seventy karatekas move quickly, making the fabric of their dogis snap, springing to the sharp and loud sound of an “Ichi!”. We have trained the kihon, the kata and the kumite, proceeding, more or less, in this order. But as always happens with the Danubio’s family seminars, we did not limit ourselves to training our body. We have deepened, reasoned, reflected on the techniques and the meaning of the Budo, the Way of Martial Art. We also trained our mind and spirit. And in the end we all went to dinner together. Yes, because this is one of the special things of the Wado Spirit. The cost of the seminar always includes a Pizza Party in the welcoming restaurant of a student of Roberto sensei, my friend Toni Cresta. A further opportunity to get to know each other, exchange information, experience or simply spend peaceful and convivial moments together, cultivating that spirit of solidarity, friendship and harmony that, as we have seen, is an important part of the spirit of Wado. When the following day we had to go back to Zurich to take our flight to Rome, from Weinfelden I took away with me a piece of that Wado Spirit and the desire to come back the next year. Because the beauty of beautiful things is that when you do them, then, you want to do them again. So, see you next year, guys. Let’s take the Wado Spirit alive. it just because it’s cool, but also because, by itself, it already says a lot about the objectives of the seminar itself.